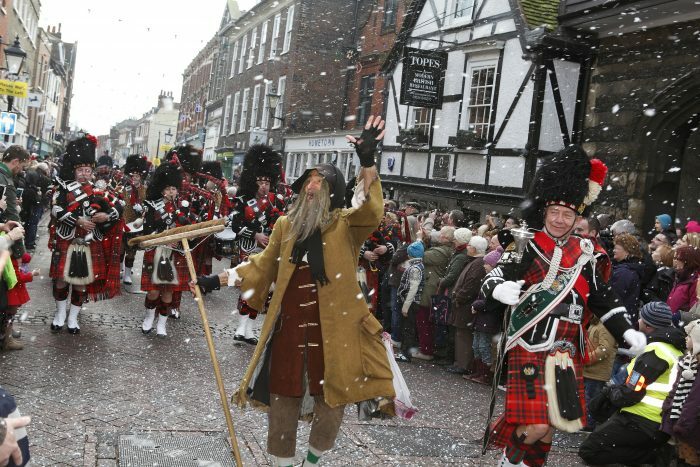 Lose any Scrooge-like tendencies at the Dickens Christmas Festival, which includes a Victorian-themed ball, two processions and carols. It takes place in Rochester, Kent where the author grew up. Roman legions light up the streets with flaming torches during the Winter Watch and Chester Saturnalia Parade in honour of a time when the city leaders passed over the keys to the city watch. To mark the shortest day of the year, locals parade the streets of Brighton with paper lanterns before throwing them into a bonfire on the beach in Brighton Burn the Clocks. Tom Bawcock’s Eve evokes the legend of the 16th-century fisherman who sailed into stormy seas and apparently caught enough food for the entire village of Mousehole. Stargazy Pie, a Cornish dish made with whole sardines, can be enjoyed at The Ship Inn on the quay. A wooden wren is carried through Middleton in Suffolk for the Cutty Wren, an animal-friendly version of an ancient ritual to hunt the wren, which was designated as the king of the birds. In Northumberland, 45 local men carry barrels filled with burning hot tar through Allendale during the Tar Bar’l ceremony, which dates back 160 years – and possibly to the Middle Ages. Gather around the bonfire for music and revelry. More flaming traditions can be observed at the Stonehaven Fireballs Ceremony to mark Hogmanay. On the stroke of midnight, performers parade the streets of Stonehaven near Aberdeen waving fireballs made of coal, wood and old jumpers tied with chicken wire and dowsed with paraffin. And there’s yet more fire in Comrie, Perthshire, at the Flambeaux Procession, where eight torches made of six-foot birch poles with rags tied to the top are hoist through the village, before being thrown into the River Earn. A pipe band marches in front of the torchbearers, while a fancy-dress procession follows. Such fire ceremonies go back to pagan times when locals would try to drive out evil spirits of the old year and then welcome in the next.